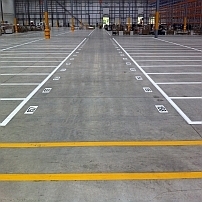 Our portfolio of internal line marking methods is established from the most durable, unique and cost effective for use in warehouses and distribution centres. We are not restricted in delivery and range because very often, our customers may demand a particular method. Rack and Shelf Labels categorises internal line marking in simple groups which are based on the level of preparation carried out prior to applying the marking system. The greater the level of preparation relates directly to the potential durability of the end product. Other companies place emphasis on the types of paint to be used, we are different in that we always recommend the best paint for a particular environment and the level of traffic experienced in the area. In order to set your mind at ease, Two Part Epoxy, Acrylic, Methyl Methacrylate and other paint types are used on our projects across the UK. We use this term to exaggerate the fact there is no change in concrete surface prior to applying paint or floor tape. It is not entirely accurate as we always clean the surface rigorously. Applying paint to a shiny ‘unprepared’ surface is not the most durable but it can be removed later for reconfigurations or if the building is leased and it must be returned to a previous state. Installation times are reduced without preparation, therefore it is a lower cost exercise which his another benefit to this method. We would always recommend this where traffic is low to absent, more durable methods would be a waste of money and time in this instance. 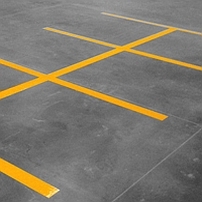 This method of preparing the concrete is the most established but relatively new for internal line marking. Shots hitting the floor remove the shinny smooth surface to present a rough and penetrable substrate that the paint can key with and ingress. This work is done with specialist machines by trained and experienced teams who install line marking on a daily basis. Shot blasting is very durable but can sometimes look feathered on the edges due to the nature of shot blasting, which can in turn result in paint flake. Shot blasting is a quick way to prepare the concrete and is the most cost effective method of durable internal line marking. We would use this type of preparation when creating block walkways or coated areas. The most durable method of internal line marking by far is diamond shaved, this process removes the surface from 1mm to 4mm below and to a predefined width, creating a channel for the paint to be applied. 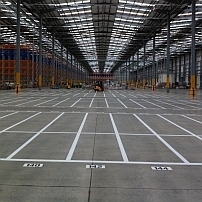 Once the paint is added, the line sits level or slightly below the surface which means forklift trucks and the like roll-over, not up-on. Paint that is raised presents a face that can be attacked, but this is not the case with diamond shaved lines. Diamond shaving is not ideal for everyone, it is expensive and a permanent change to the floor, however in terms of return on investment it is unsurpassed. If you would like to discuss our internal line marking in more detail please feel free to contact us, we appreciate that this is a complex area with too many so called ‘professionals’.